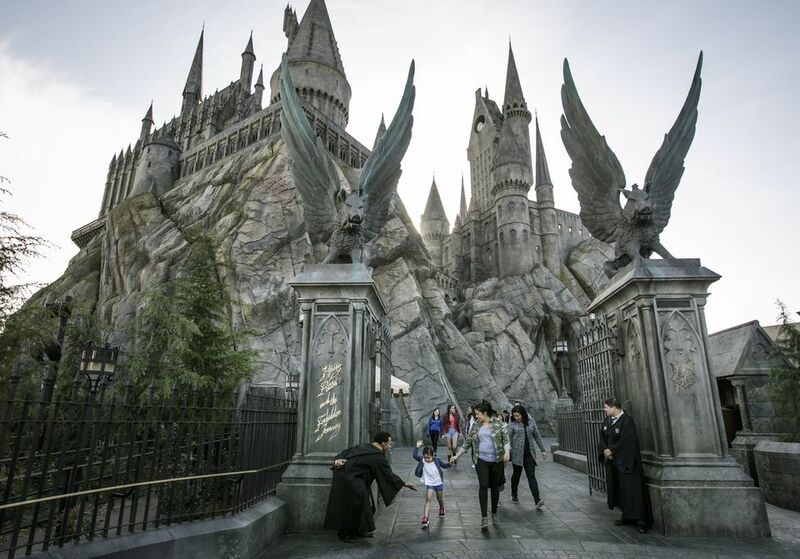 At sister theme park resort, Universal Orlando, the Harry Potter lands have been wildly popular and have garnered enormous critical acclaim. Now, you can experience J.K. Rowling's mythical stories at the original movie park, Universal Studios Hollywood. Its Wizarding World of Harry Potter - Hogsmeade is similar to the Florida original, but it has some unique features. Note that the Wizarding World is included with admission to Universal Studios Hollywood. The highlight of the land is Harry Potter and the Forbidden Journey, a highly sophisticated attraction that uses innovative robotic arm vehicles to send passengers on an adventure with the boy wizard. It incorporates both practical sets with wild effects and projected media to simulate flying and other sensations. Forbidden Journey is among the world's best theme park attractions. The ride is located inside the massive Hogwarts Castle. Getting to it is an adventure in itself. The tricked-out castle is loaded with delightful effects and artifacts. The pre-show, presented in a couple of acts, sets the stage with some intriguing theme park trickery. One word of caution: Forbidden Journey a surprisingly aggressive attraction. Heed the pre-ride warnings. If thrill rides aren't your thing, you may want to think twice before boarding it. When the ride first opened in Hollywood, it featured 3D media, requiring passengers to wear 3D glasses. Some guests had been experiencing motion sickness in reaction to the 3D experience; the park has since removed the 3D media. If the line to board the ride is especially long, you could break up your party and opt for the single rider line. You could also consider upgrading to front-of-the-line passes, which can be pricey, but could save you a lot of time in the Wizarding World and throughout Universal Studios Hollywood. Rather than rushing to the Forbidden Journey attraction and skedaddling on to another area at Universal Studios Hollywood after it's over, visitors, especially diehard Potter fans, should take the time to linger in Hogsmeade Village. The level of immersive themeing is incredible. You'll feel as if you have truly entered the Scottish village depicted in Rowling's books and the movies they inspired. There are actual props from the movies embedded around the land. The "ancient" buildings look as if they have endured centuries of wear and lean this way and that from settling. Window displays spring to life when activated by specially equipped wands that are available for purchase. Even the bathrooms are themed. Tanks are mounted above the toilets as if they were installed eons ago. And if you listen carefully, "Moaning Murtle" can be heard lurking in the loos. At the front of the land is Hogsmeade Station and the Hogwarts Express. Stationed in front of the train's smoking engine, a conductor greets guests as they enter. The train, however, never leaves the station. Inside the station is a reproduction of a Hogwarts Express passenger compartment in which guests can have their photos taken. Among the shops are Zonko’s Joke Shop, which sells silly items such as extendable ears. All kinds of wizard stuff, quidditch gear, and Hogwarts school supplies are available at Dervish and Banges and Filch’s Emporium of Confiscated Goods. Goods can also be purchased at Wiseacre's Wizarding Equipment and Gladrags Wizardwear, two stores that are unique to Hollywood's Hogsmeade. Honeydukes offers sweet treats such as Bertie Bott’s Every-Flavour Beans (gravy-flavored jellybeans, anyone?) and chocolate frogs. At the wand shop, Ollivanders, visitors can see a brief demonstration in which the wand chooses the wizard before heading off to purchase an authentic Harry Potter wand. At the original wand shop in Florida, the capacity is very small, and the lines can be very long to see the show. In California, the park has doubled the capacity, but the lines can still get quite long. British fare such as fish and chips is available at the quick-service restaurant, Three Broomsticks. It's surprisingly tasty and a definite cut above typical theme park food. The magic elixir, butterbeer, is available at the Hog's Head Pub adjacent to the restaurant as well as at beverage carts. It is so popular, you would probably feel as if you hadn’t truly visited the Wizarding World unless you purchased and consumed one. The delicious and curiously addictive non-alcoholic drink is available cold and frozen (our favorite). Regardless, both are topped with a frothy foam that invariably gives those drinking it a white mustache. Should you want to order a Budweiser or a Pepsi at Hog's Head Pub, you're out of luck. The same goes for camera batteries, Universal Studios-branded sweatshirts, or any other "muggle" item you might search for at the shops in Hogsmeade. The attention to detail and the commitment to the story is so intense at the Wizarding World, only items that would exist in the mythical Potter universe are available. The second ride at The Wizarding World of Harry Potter in Universal Studios Hollywood is Flight of the Hippogriff. Based on the mythical beast in the Potter books and films, the small, family coaster goes easy on the thrills and is accessible to a broad range of visitors. In fact, if you are a coaster wimp and generally afraid of thrill machines, you might want to give the Potter ride a whirl to give them another try. Even if you find it more aggressive than my description, the ride is very short, and you wouldn't have to endure it for too long.